‘Origin’ was developed for the porter’s lodge. An installation that has much in common with the monumental work ‘Breathing Cloud’ from 2007. 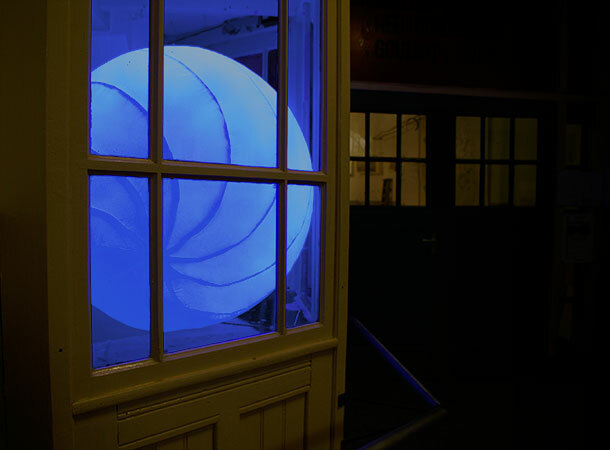 In the historic inner court of Het Kruithuis in ’s-Hertogenbosch, a luminous inflatable enclosed by a greenhouse was exhibited. In the entrance hall of the Willem II factory the enclosed, secure inner space of the porter’s lodge is also used to good effect. Passers-by are invited to ponder for a moment on the transition from one space to another: from inside to outside, from outside to inside. Mary van Erp, Brabants Dagblad, May 8, 2008. Opening hours: Thursdays through Sundays,1 to 5 p.m.